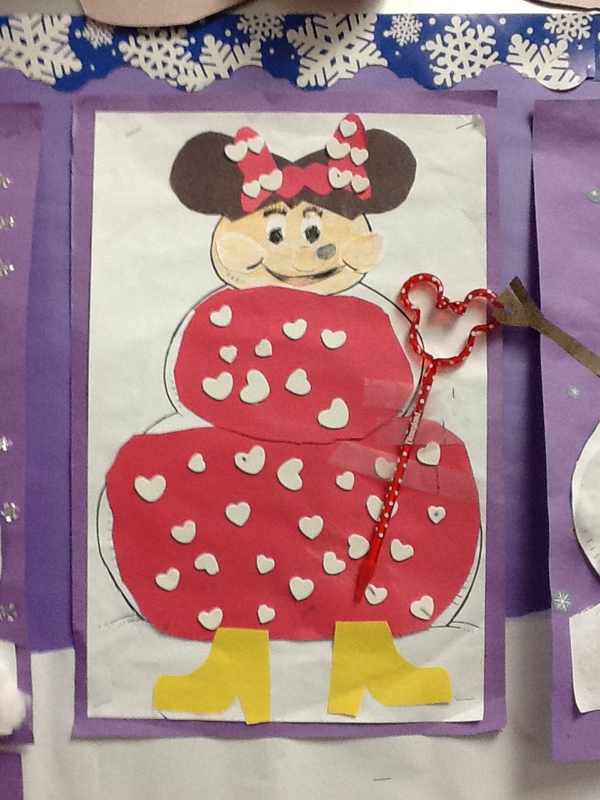 February | 2012 | Mrs. Anton's Class! Today we continued to put our books together! Luckily we had a lot of help! My daughter came in again to help with the recording. 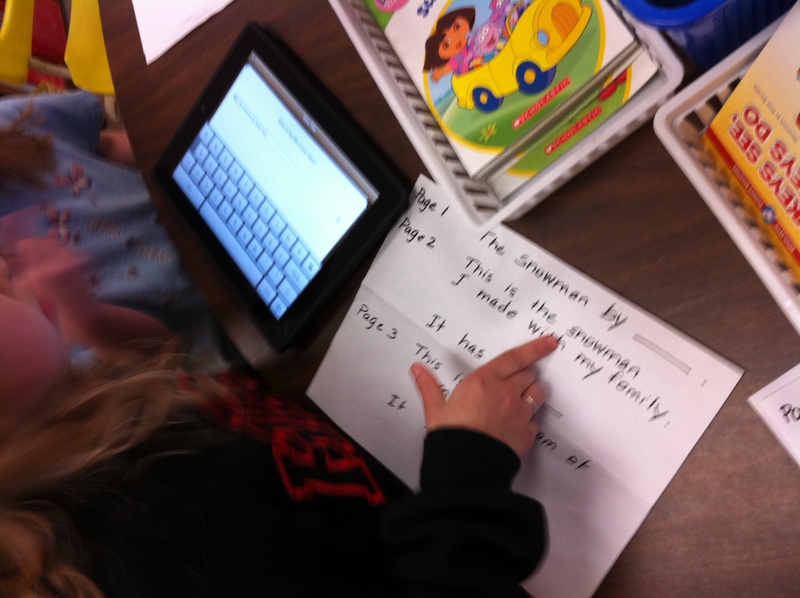 We also had a lovely surprise visit from Mrs. Beleznay who coordinates the iPad Project Success project! She offered to help too! So for about an hour, the three of us took each child one at a time to help them record their stories on the ipad in the Pictello app. We managed to get almost all of the projects completed! I am very grateful for all the help! The next big job will be uploading the books to the Pictello server so that we can save them and email them out to parents who wish to have a copy of this book in either Pictello book format or as a PDF file. We are hoping to share our books with parents on Friday, March 9th. They are not very long but they represent a wealth of learning. Learning how to create digital books, using different tools in a paint program, learning how to add text and text boxes are just a few of the strategies we have worked with over the last few weeks to make the pages for our books! 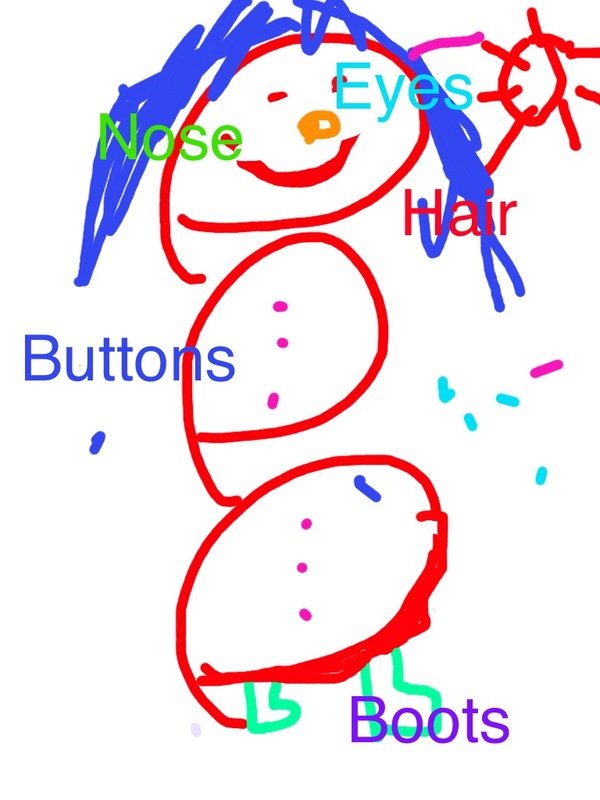 I have included some more of the samples of snowmen that families created as well as the snowmen labelling pictures the children did. I have to admit that I loved that project! Today we started putting together our Pictello books. 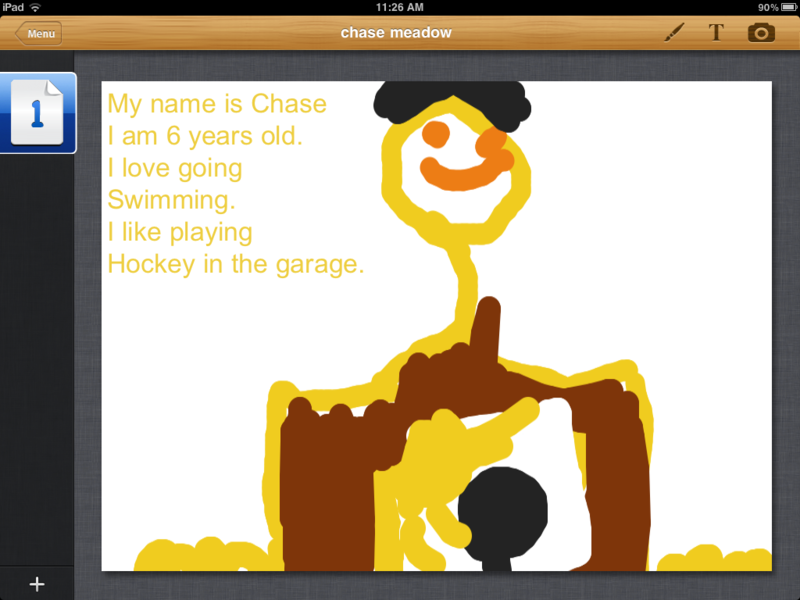 I gave the children a quick demonstration on how to use the app to make a book. Then we worked through the outline I gave them. This is a big project for little people. Luckily we had a bit of help! Mrs. Turner, our class volunteer was here today and my daughter came in to help too! The children got started and with a few bumps and hiccups we got some of the books started. The children had to open the book file and on each page import a picture and then add some text in the appropriate boxes to go with each picture. They had to import the picture from the camera roll on the iPad which meant finding it on the camera roll and then selecting it to add to that page. Adding text is not easy either! Trying to figure out how to get those capitals and periods is a bit trying. The children continued on in the afternoon with help from each other. As you can see from the pictures they are very focussed on their jobs and helping each other. I had to do some editing, but by and large I am happy with the result. We will continue to work on the remaining books tomorrow and on Wednesday. On Friday morning, the iPads went travelling. 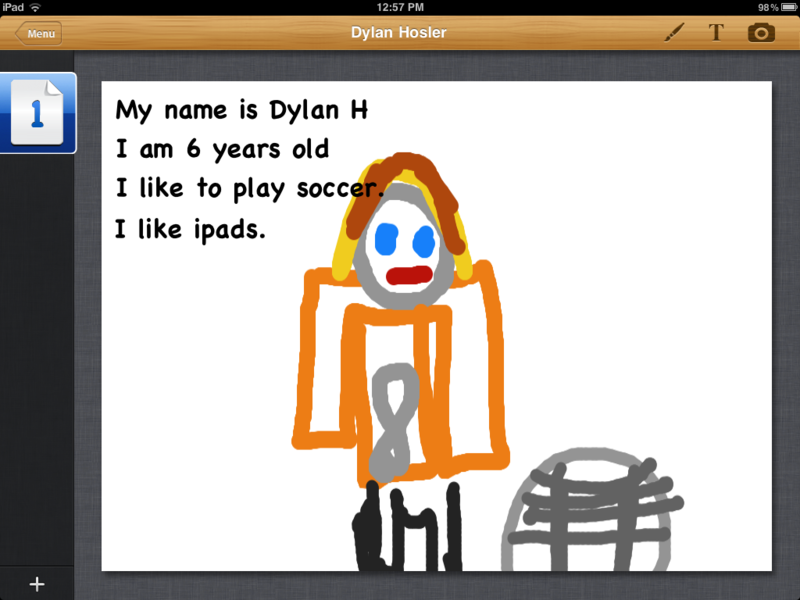 The iPads travelled to several primary classes and were a big hit with everyone! 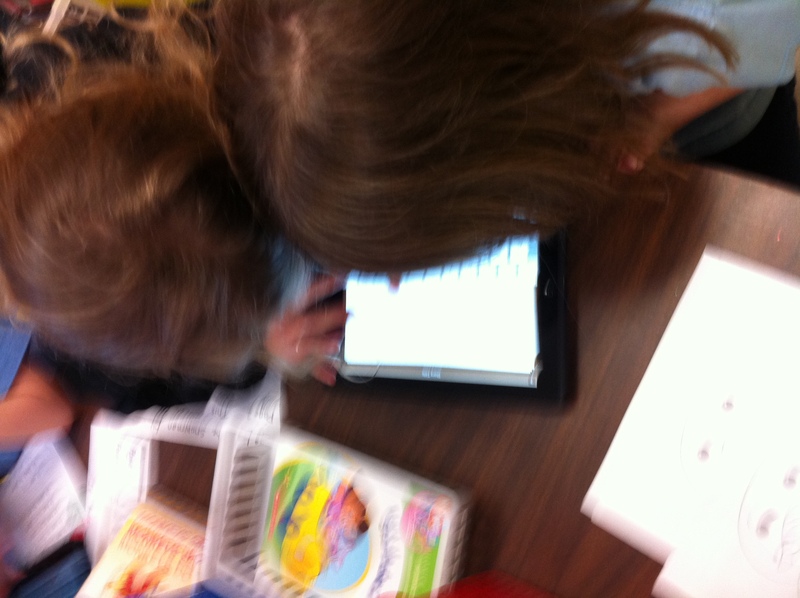 We introduced a variety of apps to each class and let them explore. Needless to say, the students appeared to really enjoy them and were fearless! 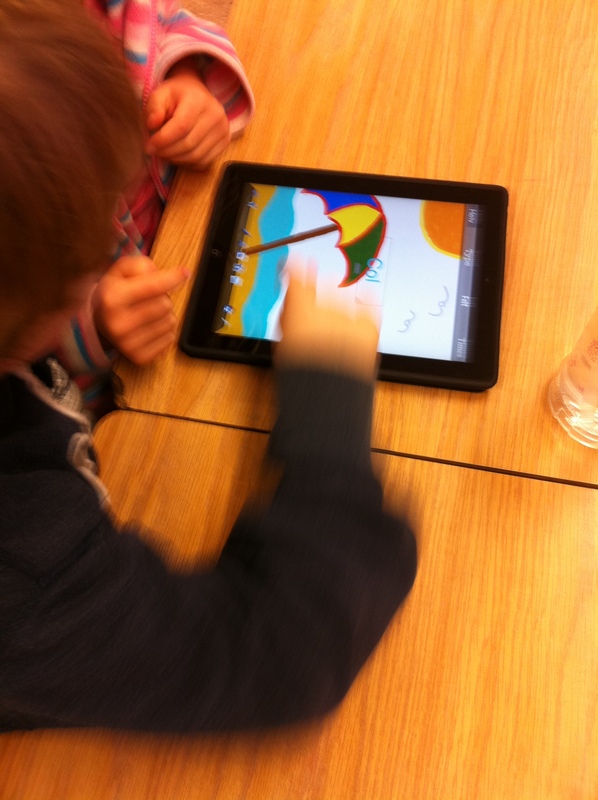 Each class worked with Doodle Buddy and tried out the vareity of drawing tools. 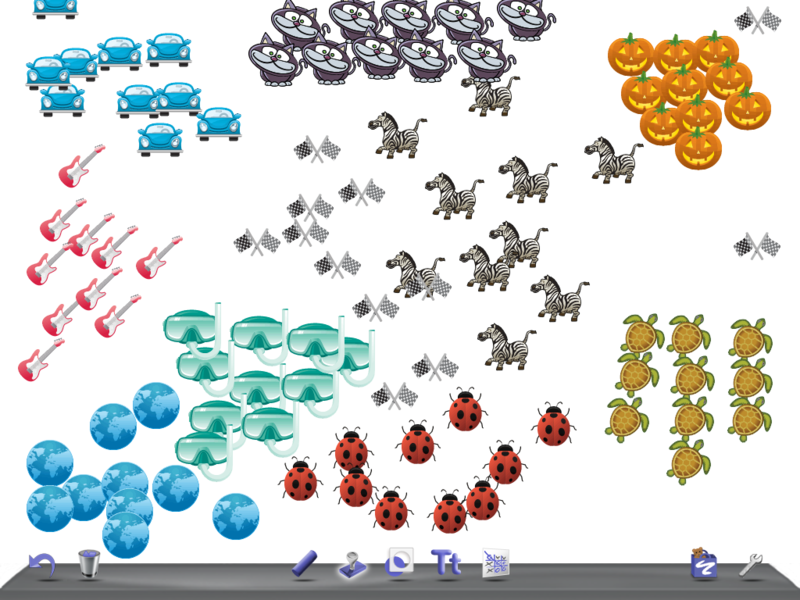 We also worked a bit with Story Buddy. 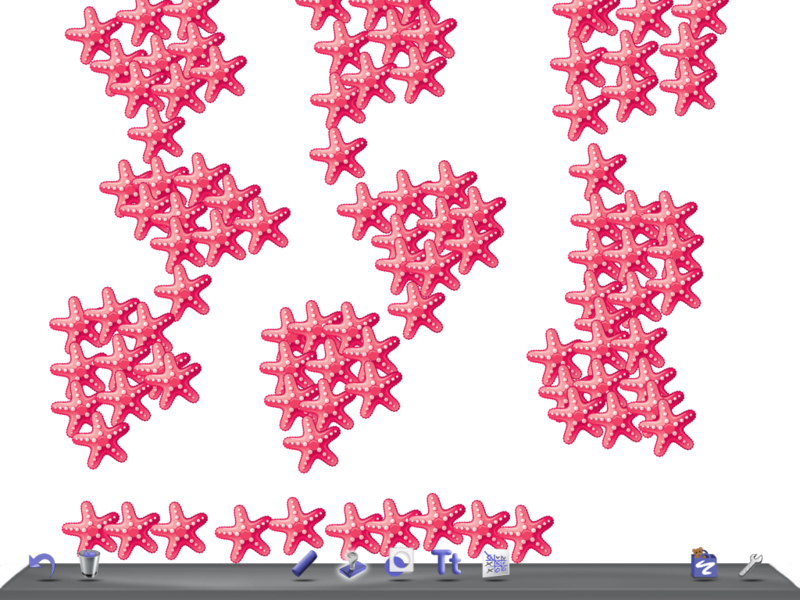 We also introduced a new app called Chickionary. This app is a word building app. You are given a variety of letters and given a limited amount of time to create as many words as you can with using the letters. I was really impressed at how focussed the students were trying to find as many words as possible before their time was up. Several classes used this app. We also introduced our favourites, Word Bingo, Math Bingo, and Montesorri Words. 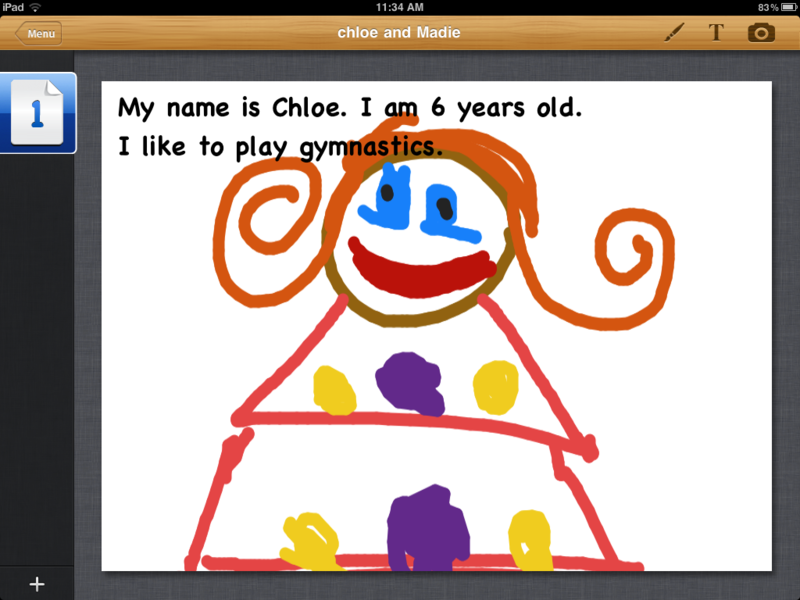 The beauty of these apps is that they can be adapted to the skill level of the student. Over the next few days the iPads will be travelling around the school. They have a very full schedule! 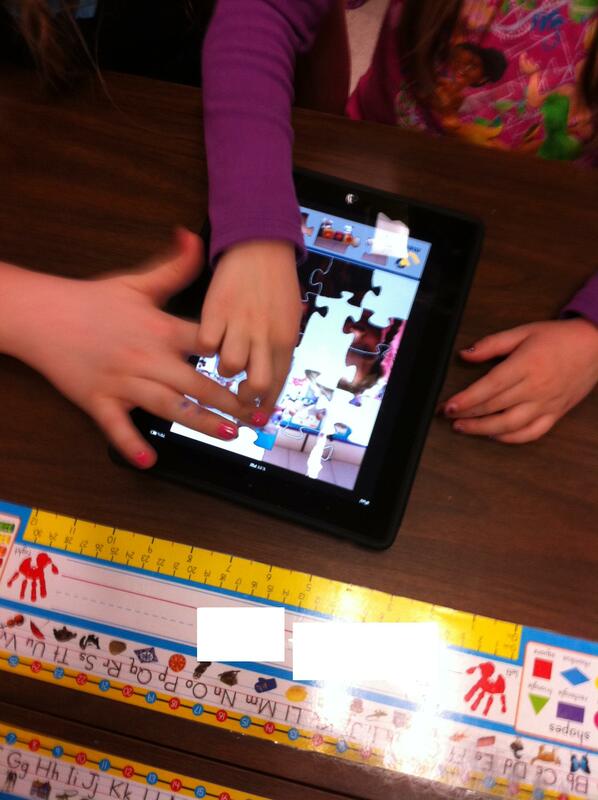 In the afternoon, we worked with our buddy class using the camera and the puzzlemaker app. Mrs. Baird told me about this app. She had her students take their picture, import this picture into the puzzlemaker app and then do a puzzle of their picture. I thought it was a great idea and we did the same thing with our buddies. The buddies took a picture together and then had fun playing with a puzzle of themselves! This coming week we are blitzing our books! We have to put them together and narrate them! Lots of work! The iPads are leaving up on March 9th. We are going to miss them! 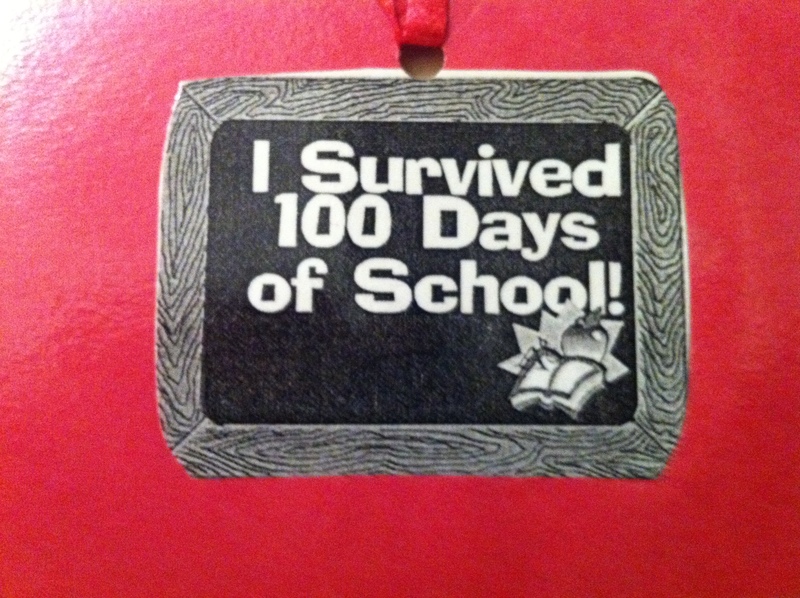 They are a great student friendly and teacher friendly teaching tool!! 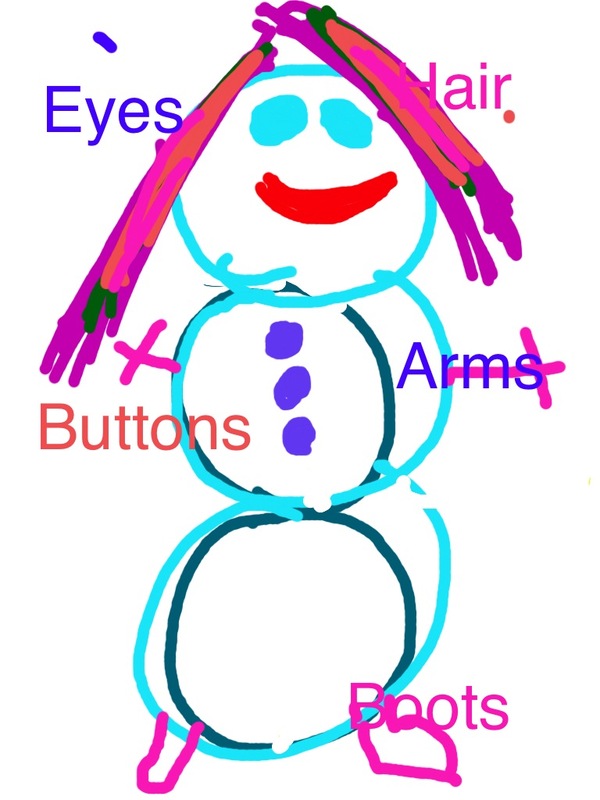 Today we started putting together all the pieces of our snowman book in Pictello. We have created four pages for our books so far. It takes a bit of time but I really feel that the product will be worth it. The children who started their books today certainly seemed willing to put in the effort. They worked steadily and were really attentive. The rest of the class worked quietly on their assignments while a few students put together their books. They were especially quiet whenever the writers were recording their stories. Very professional, don’t you think? Pictello allows you to send a copy of the books created to their server. If you have an iPad with the Pictello app loaded on it you can download the story and keep it forever. It also allows the book to be sent as a PDF file. This version is simply the pictures without the accompanying text or recordings. Either way, we can arrange to keep some sort of copy of their efforts before the iPads leave if all goes well. I have been able to send a copy of one book to myself as well as the PDF files so I hope that I can do it with all the student books. 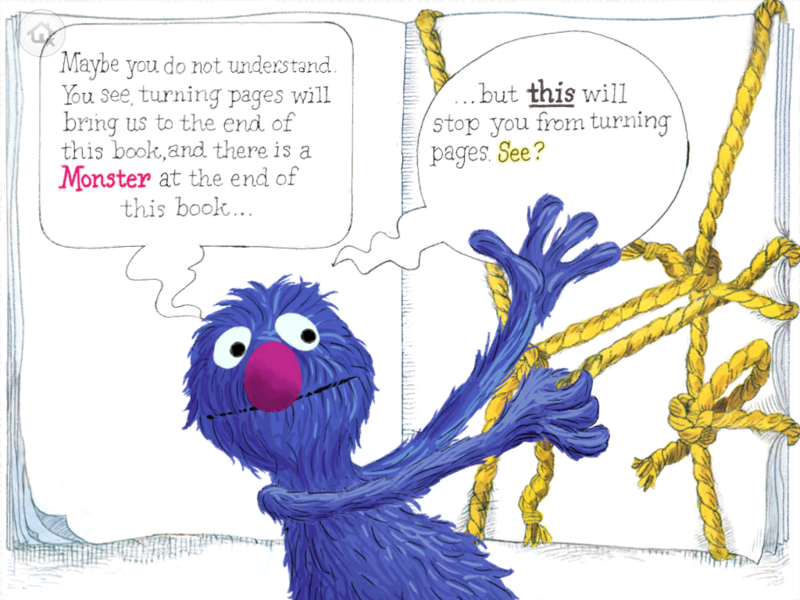 Today at storytime, we enjoyed The Monster at the End of this Book. It is a book app that I downloaded on my personal iPad and shared with the class today using our computer on wheels projector and the iPad combination. It is a really cool app that tells this funny story in a fun way! You can’t help smiling at this story. We read it twice and each time we had a good giggle at the end. Yesterday, Mr. Ball and I introduced the iPads to our staff on our professional development day. We worked through a variety of apps and learned a lot of new things. Over the next few weeks, the iPads will be visiting other classrooms so that the other students in the school can get a taste of this wonderful technology! 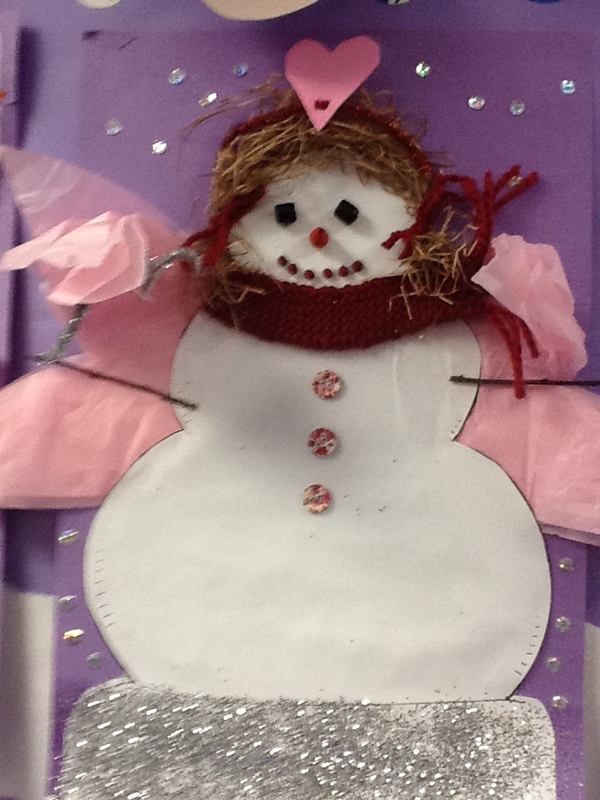 Today we worked on our snowman project again. 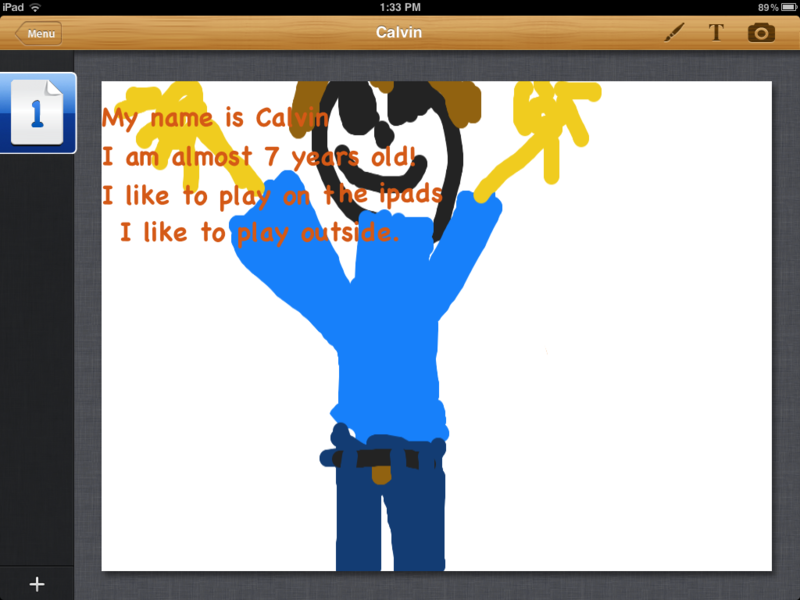 We worked with Story Buddy to create the author’s bio page. We have been working hard in several different apps to create a compilation of pages. 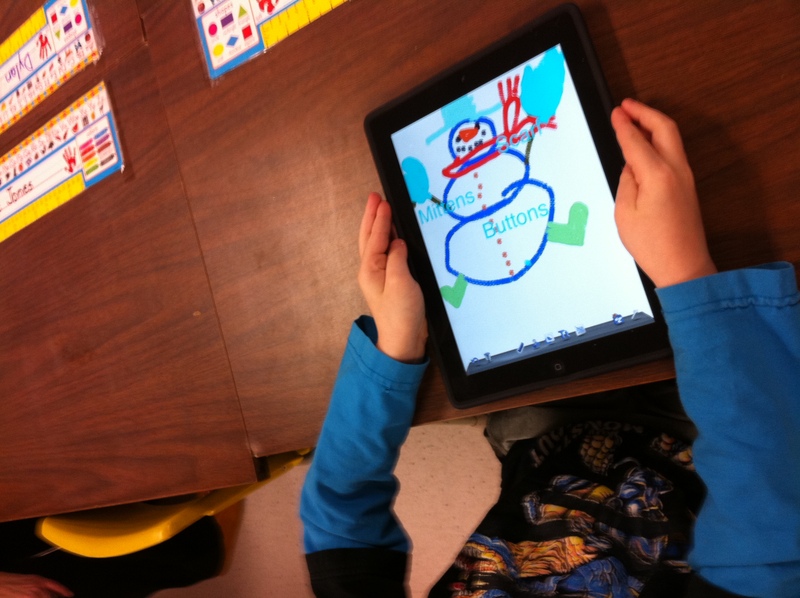 Then the pages will be imported into the Pictello app to create their very own story about their snowmen. So we made the author’s biography page to put at the back of their book today. 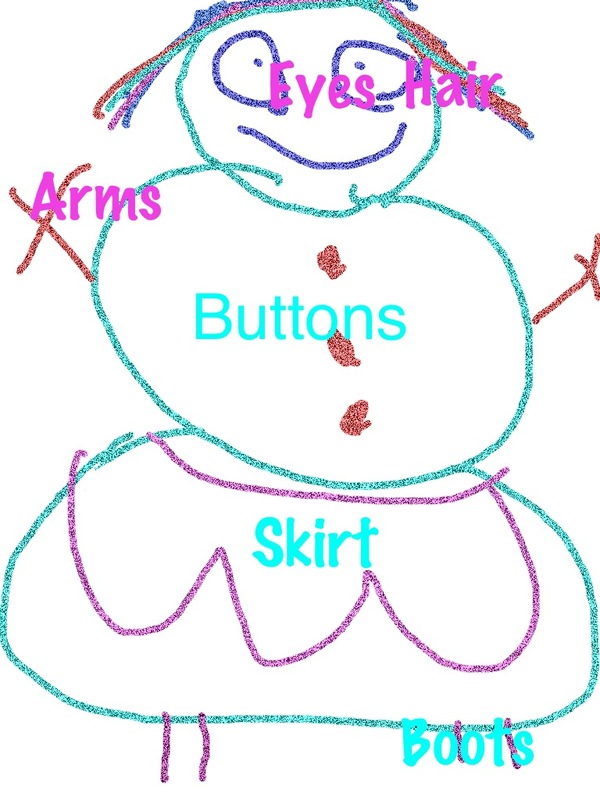 The children drew a picture of themselves and then added a short bio of themselves using a text box on the page. Adding text in this app can be a little tricky as it is not easy to go back and try to correct misspellings and so on. 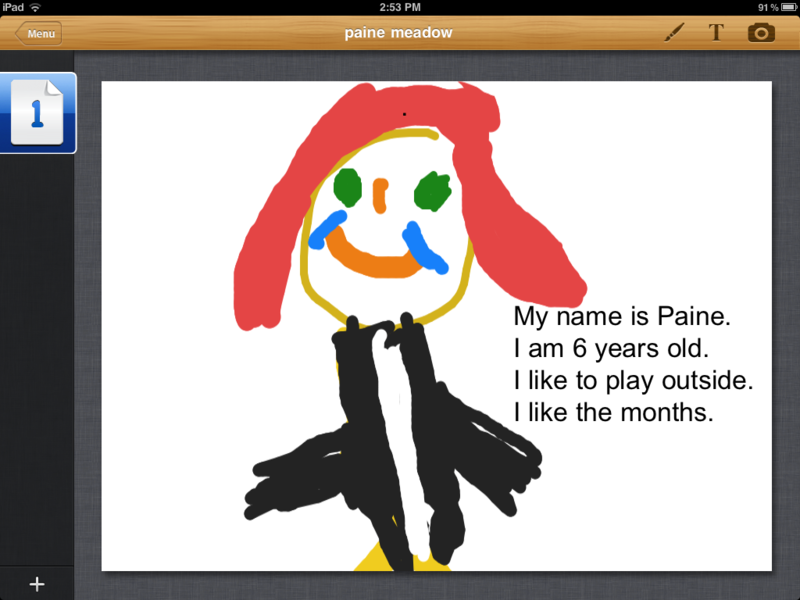 We took a photoshot of their work which puts their picture on the camera roll of the iPad. Items on the camera roll can be imported into other projects. Over the next few days we will begin to work in small groups to put the books together. We are looking forward to sharing them with you. I think they are pretty good for students who are six years old and almost seven! Look closely at Calvin’s bio. He told me he was really close to being seven and I could tell that putting six on his story wasn’t going to cut it. 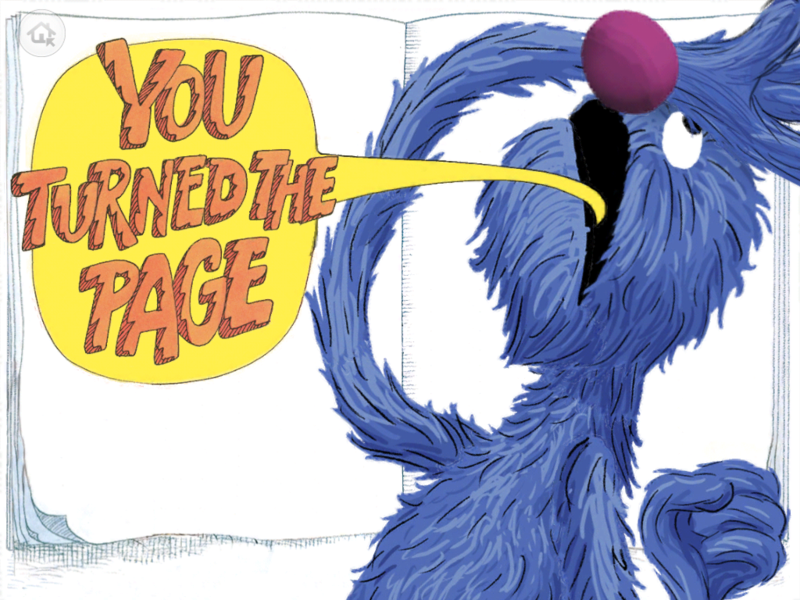 So we figured out how to tell that in his story! 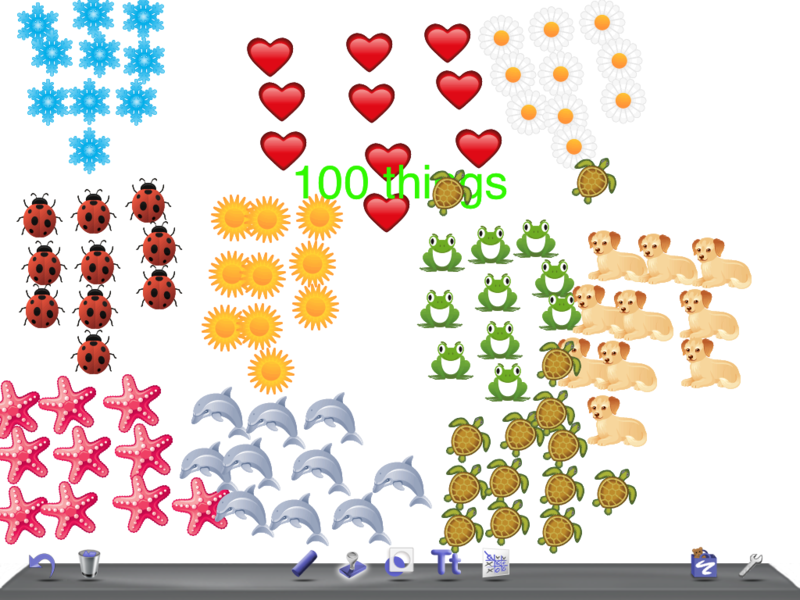 Today we worked with Doodle Buddy again. I have to admit I was a bit nervous about this project! I introduced text boxes to them and I thought it would be a big deal and I was even crazy to attempt it…. Wrong!! 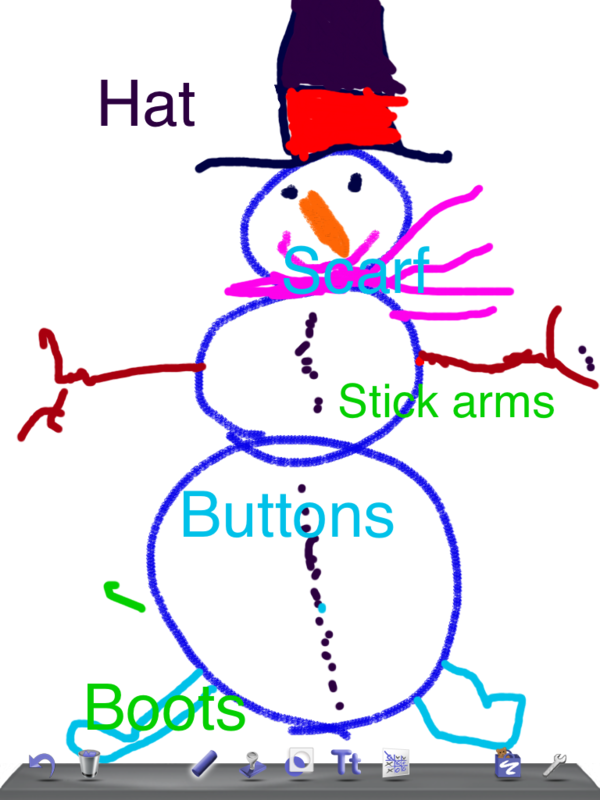 The object of the lesson was to draw a snowman for our snowman book project and label all the parts. 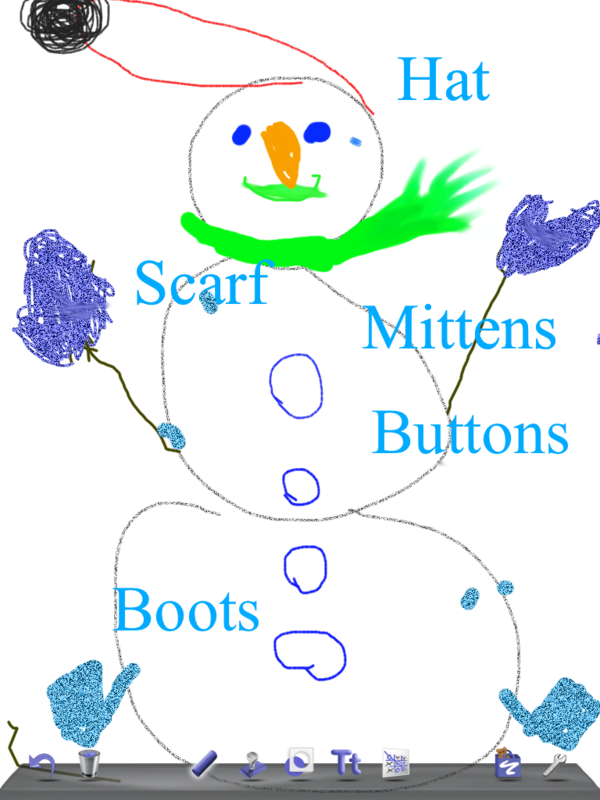 This meant that the children had to open text boxes, move the text box to a spot adjacent to the part of the snowman, and then add the text. That meant that the children had to open, move, and complete at least six text boxes! Not a little job! We brainstormed the parts we felt had to be labeled and I put these words on the whiteboard. Of course, once they got started they added more detail and needed more words! We had a big conversation about being patient about waiting for help if they got stuck because there was only one teacher and one aide and so on…. Then I let them loose. Well of course my jaw dropped down to the floor because they took it all in stride and were moving text boxes and adding text almost immediately. Within the first little while, I had some student assistants who quite happily went to the aid of their friends and the job was completed! And the results were even better than I hoped for! Take a look!